Alexandra David-Neel (1868 - 1969) was an Oriental scholar and traveller in Tibet, born in Paris, France. She studied Sanskrit in Sri Lanka and India, then toured internationally as an opera singer. She continued to travel in Europe until 1911, when she returned to India, visiting the Dalai Lama in exile at Darjeeling and studying Tibetan Buddhism. Expelled from India in 1916, she went to Burma, Japan, and Korea, arriving in Beijing in 1917. She returned to Tibet in 1934, but was forced to leave by the Japanese advance of 1944, and retired to Digne in France. 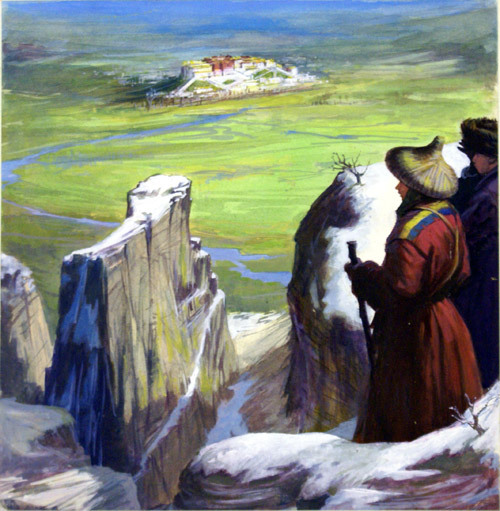 An original painting used on the cover of Look and Learn 12th April 1975 depicting Impossible Journeys.